This the second Big Mini I have tried and one of the cameras I tried in my last week in Japan. The first one I tried had a faulty flash, but this one’s worked well. The panoramic switch next to the viewfinder was loose and kept returning to that setting, so I taped it up. If I decide it is worth the weight to keep it I might end up glueing it in place as that feature is superfluous now. This time I did not use an experimental film but did use a new-to-me developing lab. I found the internal panoramic mask a little confusing at first given the issues with the switch. When turned off the mask is down whether it is the choice or not. 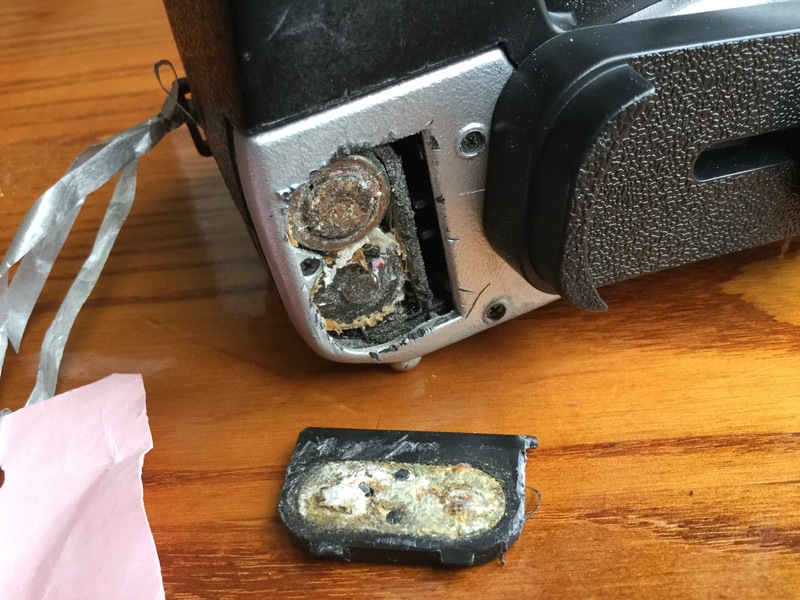 So when putting a film in the camera you might think the mask is stuck. Once you turn on the camera the lens moves forward and the mask shifts into the correct position. There is a cool cover over the lens that moves out of the way when switched on. 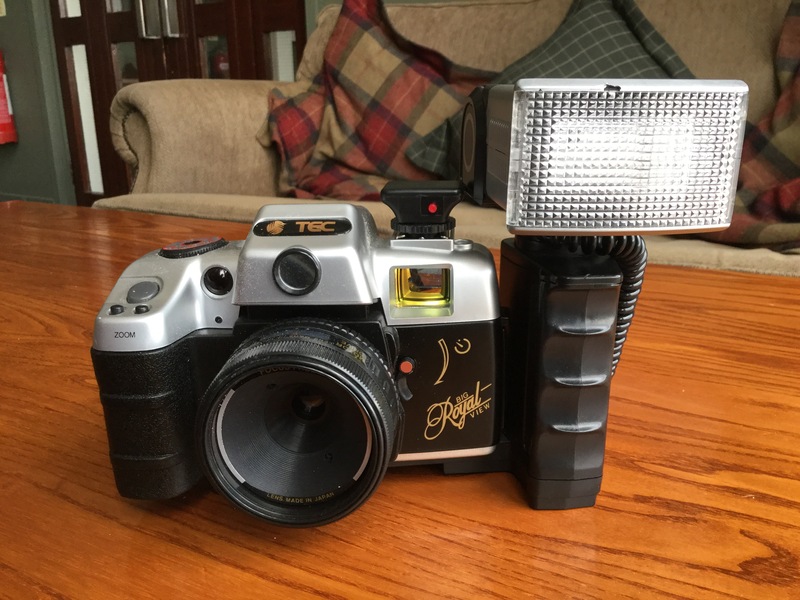 You can find technical details for this 1994 camera here. I used two point and shoots around the same time, this one and the Olympus Mju 105 Delux. I much preferred the results from this one. That might be due to the slightly larger aperture of 3.5 as opposed to 5.6 on the Olympus. The zoom on this one was smaller, 35-70mm. I got both films developed at the same place and both had the same purple tinge, though we were having heatwave maybe the film just melted. Here are the results from this camera. Ok, ignore the film, the camera is sharp. It looks great. Given a choice between this and the Olympus I choose this one. Plus as I am leaving I do not have to use that lab again. But my overall feeling is that I do not like either. Keep or Sell: I think I took it back to the shop or gave it away, I don’t remember now.. It wasn’t worth the weight. While on holiday on the Isle of Mull I saw a charity shop. So of course I stopped and checked out any cameras. They had one. So for fun and charity I bought it. Once I got it back to the hotel I did some research….there is a storm brewing so there is no travelling today. Anyway, I couldn’t find anything in the net apart from it has a few names and is a toy camera of the Lomography and Holga fashion. Super. I can play with this around the hotel while the rain falls. It takes 2 AA battlers in the camera and in the flash. I have those. Double super. Bugger. Oh well, money to charity at least. 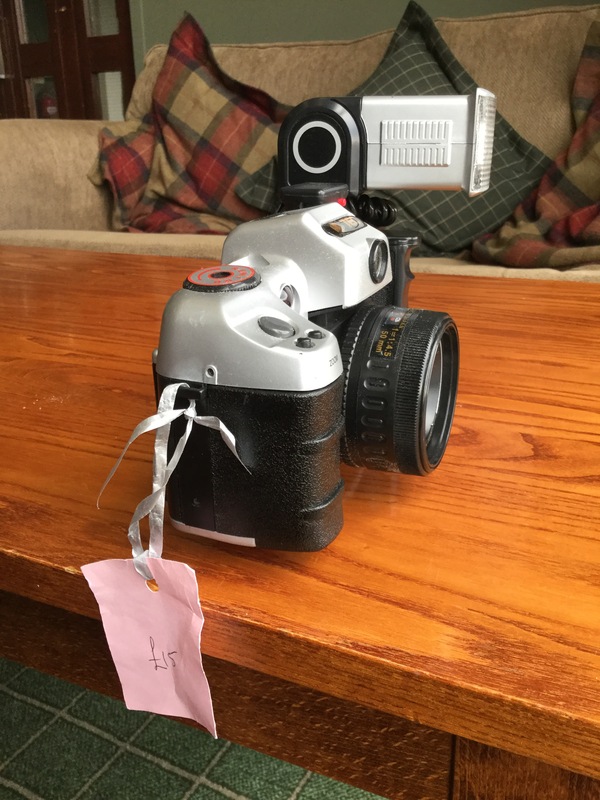 Update: I found another one of these cameras, this time a Nokina with no damage. I took it for a tour of Leeds South Bank. I used a 200asa film, but as you can see 400asa or even 800asa would have been a better choice. It really underexposes films. 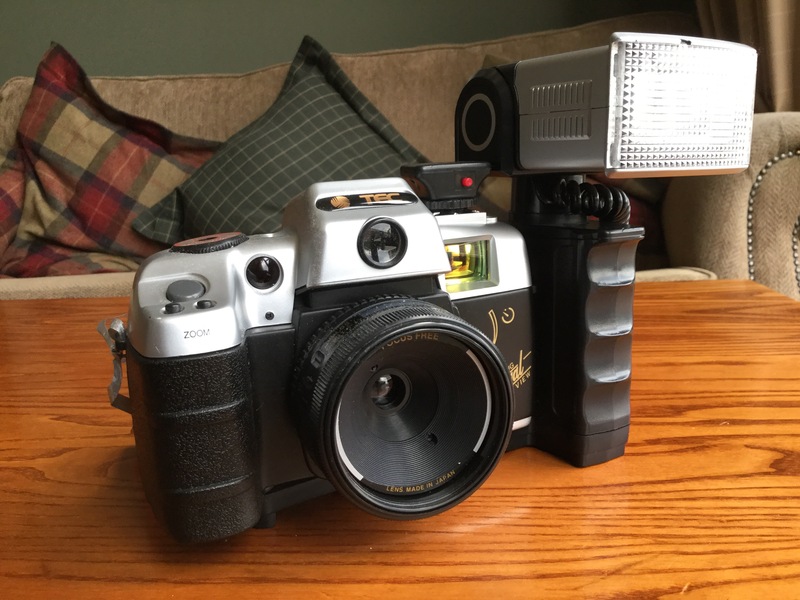 From what I see on Lomography, it is a constant issue with these cameras. The flash unit didn’t work so I took it off, quite frankly it was embarrassing to walk around with it on anyway. I loved the viewfinder on the top, but that was about all. The motor drive on the camera was quite loud. 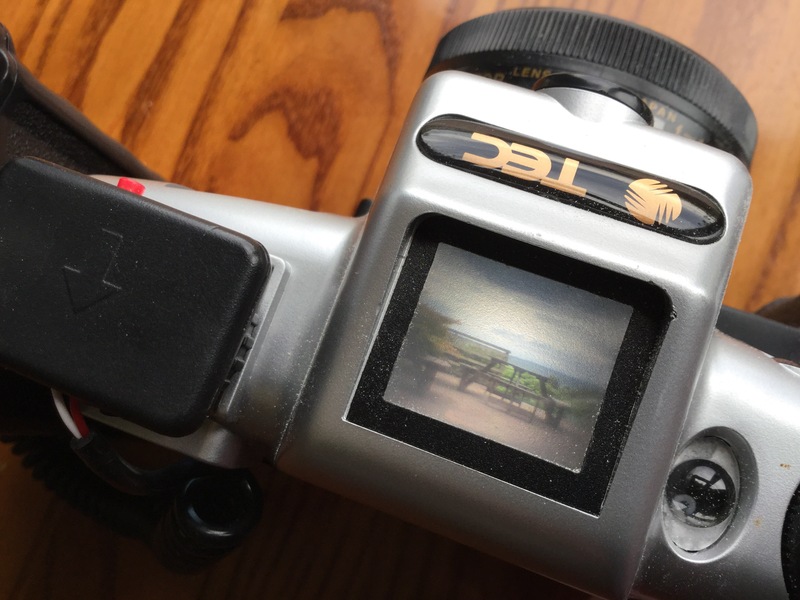 When using the Nokina, it seems like you are focusing by turning the front but it is fixed focus. The turning changes the aperture. At the end of the day the photos are sharp, but underexposed. I am glad I finally got to use one. Now it will go back to the charity shop from whence it came. I would not recommend them, there are many better cameras in the world.